Posted by Summerspeaker in Anarchism, The Singularity, Transhumanism. I write this post from the Starbucks at Union Station mere hours after the festivities ended. The experience has left me simultaneously hopeful about the possibilities of the transhumanist movement and overwhelmed by its absurdity. Our dreams of body and society transformed via technology become almost unintelligible when read through the lived realities of the present day – especially for those of us on the margins of capitalist industrial civilization. Torn jeans and toes peeking out of worn-out sneakers defined the bus ride here from the cozy conference hotel in Marina del Rey. Through the lens of inequality and impotence, I perceive a wealth of productive tensions in the ideological foundations and material dynamics in effect at Extreme Futurist Festival 2011. The event featured an eclectic mixture of themes, aesthetics, and political positions broadly united under the umbrella of culture and technology. Speaker topics ranged from the neuroscience of vision to polyamory. Ian Midgley‘s presentation on Open Source Ecology appealed the most to me. The decentralization and democratization of the means of production would prove a great boon to creating revolutionary autonomous communities. Here we find a point of convergence between the communist anarchism I advocate and the libertarianism that permeates the transhumanist scene. The interest in independence and innovation I encountered from XFF participants resonates with me and stands out as an site for collaboration. We can at least agree on the vast negative utility caused by state coercion and above all corporate-government collusion; the Occupy Wall Street movement made various appearances and received significant sympathy. However, the transhumanist emphasis on creating alternative systems rather than engaging in social struggle to dismantle the existing order comes hand in hand with a problematic conception of power. I suspect Michael Anissimov and company underestimate the importance of established oppressive hierarchies. Access to technology, information, and physical resources remains profoundly limited for almost all of us. The project of escaping inequality through personal empowerment and open-source entrepreneurship strikes me as primed for failure. I enthusiastically support the spread of knowledge and spirit of creativity but consider these things utterly insufficient to undo the nightmare of heteropatriarchal capitalism I walk through daily. How can we forge a parallel society when the bosses control the bulk of the world’s wealth and jealously defend their dominance with extreme force? In the absence of massive solidarity networks, seasteading seems doomed to either serve the interests of corporate and elite sponsors or succumb to violent repression at the first spark of promise. The all-to-human details of XFF highlight the chasm between transhumanist visions of post-scarcity playgrounds and the our contemporary powerlessness. Unsurprisingly, in practice transhumanists function rather like anybody else. Michael doesn’t have comic-book superpowers just yet. When I walked to the location of the XFF VIP party on Friday morning, I performed the role of biological alarm clock for the event organizers. We made signs for merchandise that nobody bought with sharpies and sheets of paper ripped from notebooks. The plan to cook a meal for the pool party foundered for lack of funds. Because of student debt and arguably neurosis, I had to get by on the bags of walnuts and pecans I’d brought with me. My mind raced through the fascinating conversations I’d had at the party and my stomach growled as I hoofed it the three miles back to the CouchSurfing host I was staying with. The fun last night concluded with a drunken romp through the Courtyard Marriott. We hummed in unison, channeled energy through crystals, and sang slurred Christmas songs in Michael’s room. Once an ultimatum came from the hotel security, we scattered to the hot tub area only to be evicted again. 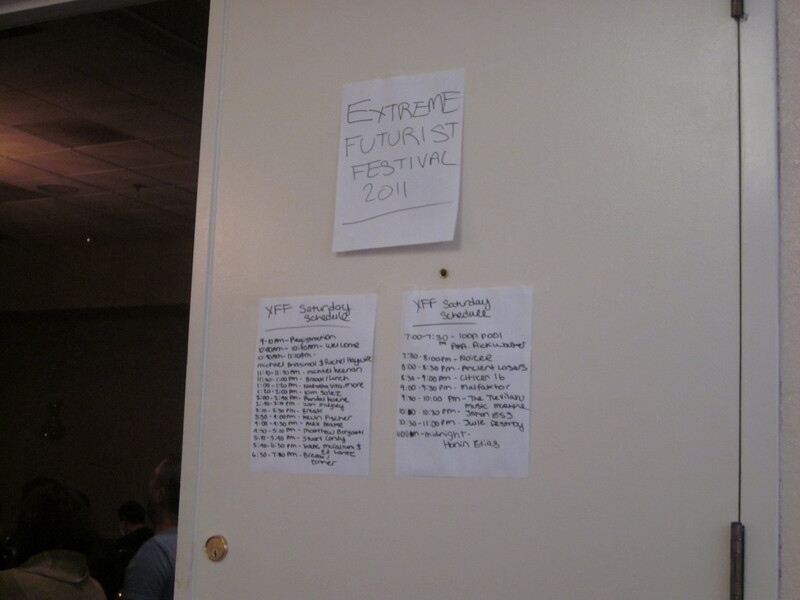 Under the influence of alcohol, XFF attendees started to resemble the bro culture they earlier criticized. Despite the notable embrace of queerness and feminism, there’s still plenty of straight white dudeness to work on in the transhumanist scene. Our reliance on the labor of the hotel staff and unseen workers across the globe to make this sort of technological conference possible went completely unacknowledged and unexplored. Because CS hosts frown on surfers stumbling in at the wee hours of the night, I found myself without a place to sleep when the curtains finally closed. Thanks the generosity of fellow attendees, I ate and socialized at an IHOP until about 4am. Only then did I trudge to a bus stop and take a long trip back to downtown LA with a bunch of homeless folks. Here at Union Station, the driver hustled eir sleepy passengers out of the bus. What does transhumanism mean to people on the street and those toiling to facilitate our speculation? Apart from millionaires like Ray Kurzweil and Peter Thiel, does the movement have even a sliver of the material power required to turn fantasies into reality? I share this story and raise these questions with twin intentions of entertainment and constructive criticism. 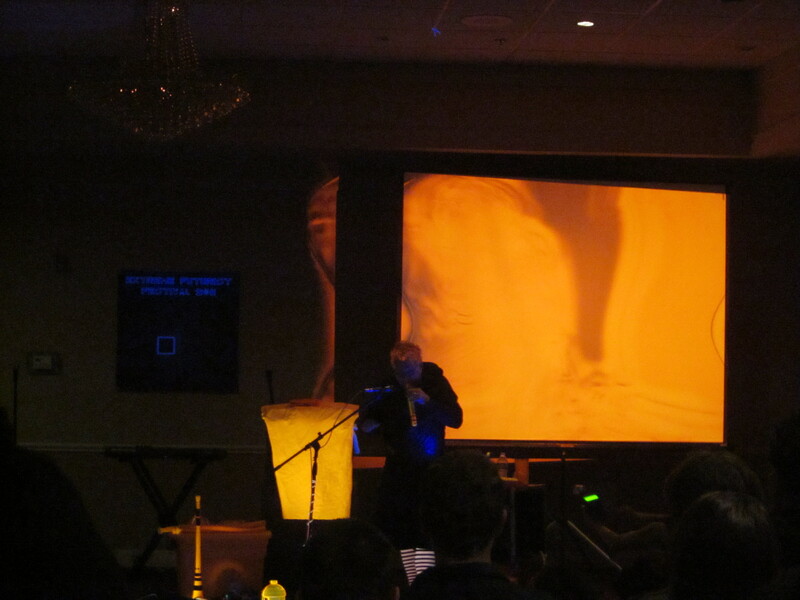 I thoroughly enjoyed XFF 2011 and extend my appreciation to the organizers and performers. In an echo of Kim Solez’s aspiration to mass appeal, I encourage the transhumanist movement to engage more substantively with workers, local community, and social justice activism. Let’s continue to expand this compelling conversation. Great article summerspeaker – you really do offer a fresh POV with the idea that H+ should unite with workers and the poor. I want to talk to you about a writing project – can you contact me at hankpellissier@yahoo.com ? Thanks! That sounds good. I’ll email you soon. Cool that Open Source Ecology was represented. I’m still optimistic regarding it’s potential, although I realise that in certain areas of the world (the UK, where I am, for example), access to land is a major problem. I’m currently attempting to bootstrap myself economically by setting up a 3D printing business, it’s going okay so far, and I’m nearly at the point where I can live off the proceeds (this kind of Open Source-facilitated venture is within reach of a lot of people – you can make your own printer now for $5-600 sourcing parts from ebay).